Luke Billings and his four reprobate sons ride into a small South African settlement in search of revenge on Police Sergeant Sam Hargis. 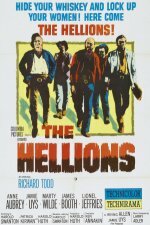 Hargis knows he cannot outgun the five outlaws and turns to the townspeople for help. But he gets no help except from a most unexpected source. Ultimately Hargis must face Billings on his own. Note this is the same Jamie Uys that features in the excellent Dirkie: Lost In The Desert. Although not the greatest picture quality this film has been added because of its rarity.